At last. A book - well, a labour of love, I should say - by someone describing himself as a cricket tragic. I do not remember many such self-styled authors. It seems entirely in keeping that a self-styled cricket tragic should write such a brave account of cricket’s most enduring format. 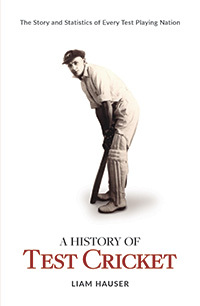 There are many books available on the history of Test cricket so it is not a subject to be taken lightly. Bill Frindall once told me, after compiling a statistical tome on Test cricket, that no sooner had the book been released than it was effectively out-of-date. Any such book does, though, bring the reader as close to the present as is humanly possible in book format. Liam Hauser has done remarkably well with A History of Test Cricket and to fit the subject into exactly five hundred pages ( excepting the Bibliography and credits). For sure it is a potted history but factually he has done extremely well to give a highly creditable overview of Test cricket and include some interesting statistics. Naturally, the statistics cannot be completely thorough but those included are concise and include some of the horrors of the lowest totals. The book includes histories of each country's playing record against every other nation. Don't, though, be put off by chapter nine including just Zimbabwe and Bangladesh playing each other as, quite obviously, their Test history has been covered in their opponent's earlier sections. Series results are also included making this the ideal, easy-to-read companion for the longest format of the game. Resumes of star players are also included making this an invaluable reference book. Liam's earlier, excellent book A Century of Cricket Tests was published, also by New Holland Publishers, in 2013 and, if he has been working on this latest venture for the last three years, he deserves great credit. He seems to be - what is the expression? - a fair dinkum Aussie, his bibliography containing references from a lot of fellow Australians. The exhaustive - and presumably exhausting to research and write - A History of Test Cricket deserves to be on the shelves of any discerning cricket collector.